We’re always happy to hear about new hotels, particularly innovative properties with unexpected amenities. Which brings us to the news release we received today that Ace hotels plans to open their first forest outpost in West Linn, Oregon. Billed as “an experiment in urban arcology,” the planned Ace Hotel Hobbit House is set to open in Winter 2018. It will occupy a domed one unit property with a skylight built deep in the West Linn woods by a mime trained by Marcel Marceau who happens to be a self-taught designer and builder. 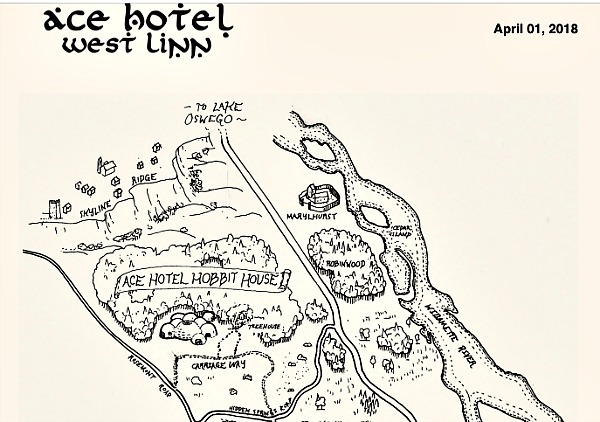 The planned forest hotel marks a departure for Ace. Though known for repurposing existing properties like the old Breslin Hotel in New York, Ace to date has specialized in hotels in urban locals including New Orleans, London, Pittsburgh and Portland, Oregon, the mother ship. Intrigued? Here’s the press release. And yes, you read the date correctly. Introducing Hudson Brooklyn, New York's Newest Organic Everything Hotel!